I finally heard back from my contact at the shelter, and all of the donated items I’ve collected this year for my local drive are going to be saying goodbye to me tooday. She is going to use the weekend to take pictures of some of the residents in the stuff that was made in order to make a special card for my dad. 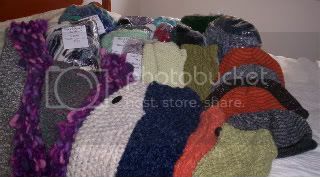 I’ve got approximately 40 items here, including several sets, either of hats/mittens/scarves or hats/scarves.